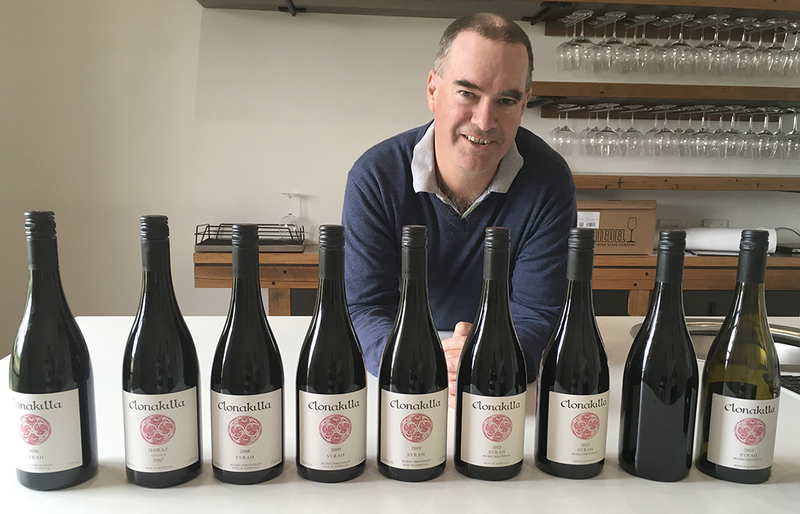 Tim Kirk hosts a Clonakilla Syrah tasting, 9 March 2017. On the far left, 2006, the first vintage; on the right, the current release, 2015. The wine was not produced in 2007 or 2011, and in 2014 only a token amount was bottled but not labeled or released. Photo: Chris Shanahan. 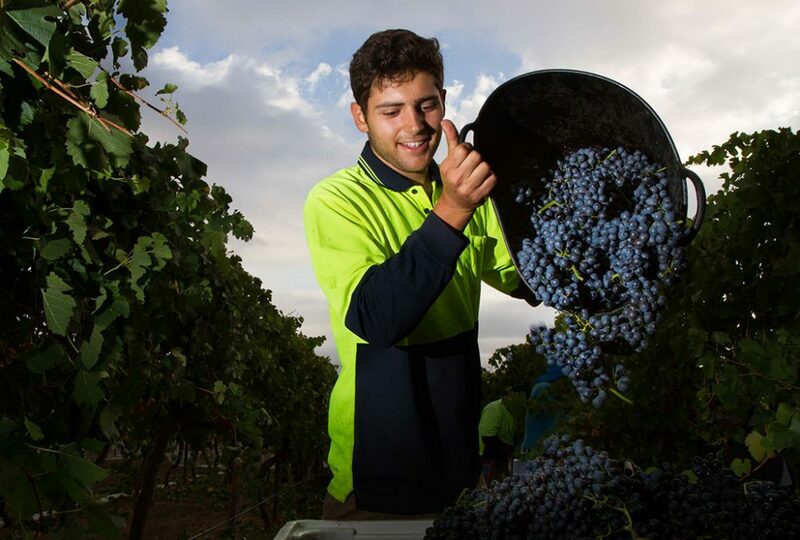 Canberra’s one and only blue-chip wine, Clonakilla Shiraz–Viognier, has a rival. And it’s from the same winery. This is its story. In 2010, Canberra’s Clonakilla Shiraz Viognier joined the blue chips of Australian wine – alongside Penfolds Grange and Henschke Hill of Grace. Clonakilla’s ranking in the “Exceptional” category of Langton’s Classification of Australian Wine – based on long-term auction demand and prices – confirmed its unique status among Australian cool-grown shiraz styles. Four years earlier, however, winemaker Tim Kirk had created a rival to his own remarkable flagship. Clonakilla Syrah 2006, a comparatively robust style of Murrumbateman shiraz, immediately attracted quality comparisons with the revered shiraz–viognier blend. 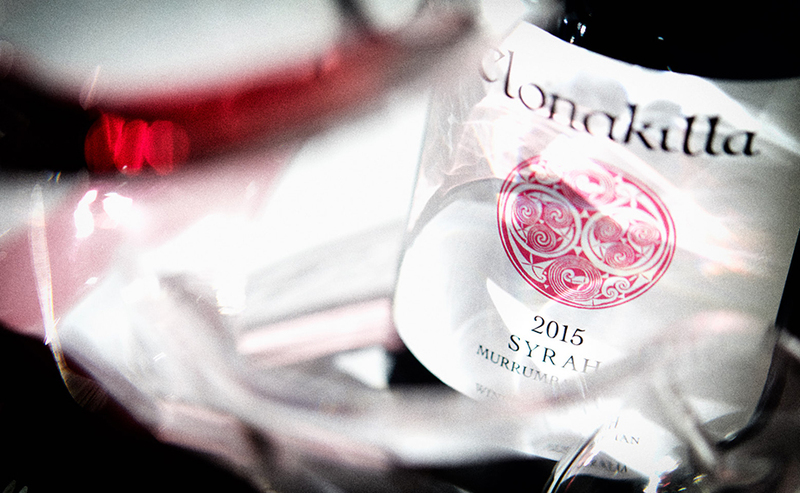 Clonakilla Murrumbateman Syrah 2015, the current release. Photo: David Reist. Although sourced from a vineyard planted in 1999, the new wine originated in Tim Kirk’s mind decades earlier – with a fascination in wines from the Rhone Valley’s Cote-Rotie and Hermitage regions. The Cote-Rotie connection, based on Kirk’s 1991 visit to leading winemaker Marcel Guigal, inspired Clonakilla’s first shiraz–viognier blend in 1992. But Kirk’s mind had also drifted further south down the Rhone to the hill of Hermitage and, in particular, to Paul Jaboulet’s La Chapelle vineyard, located on terraced slopes below the tiny chapel of Saint-Christophe. He still regards Jaboulet’s La Chapelle 1990 as one of the greatest wines ever tasted. Kirk drew inspiration, he recalls, from Jancis Robinson’s writing on Hermitage’s leading producers. She once described good Hermitage as “Always majestic. Slow to mature, deep in colour, magnificently and hauntingly savoury rather than sweet and flirtatious, the quintessential syrah”. Robust, savoury shiraz from Hermitage contrasts strongly with the fragrant, fruity shiraz-viognier blends of Cote-Rotie. But the style differences derive largely from the comparative warmth of the two regions. Even with Hermitage in mind, Kirk remained limited in the wine styles he could produce by the nature of the fruit coming from the vineyard. However, new plantings on a warmer site expanded the possibilities. Harvesting shiraz from the T and L 1 vineyard, the warmest of Clonakilla’s sites. Photo: David Reist. In 1999 Tim Kirk and wife Lara planted shiraz on land they’d bought adjoining Clonakilla’s existing Murrumbateman vineyards. Within a few years the highest, warmest point of the new T and L 1 vineyard produced intriguing shiraz, notably more powerful than wine from other parts of the estate. For a time, Kirk made wine from the block separately for observation, but ultimately blended it into the flagship Shiraz–Viognier. However, from the 2006 vintage, wine from T and L 1 earned its separate identity, and instant acclaim, as Clonakilla Syrah. Comparatively powerful, tannic fruit from the site – the warmest of Clonakilla’s vineyards – underpins the style of the Syrah. But Kirk also uses fruit handling, fermentation and maturation techniques that add to the differences between the two flagship wines. Clonakilla Shiraz–viognier, modelled on the wines of Cote-Rotie, comprises shiraz fermented with the white variety, viognier (5–6 per cent of the blend); Clonakilla Syrah is 100 per-cent shiraz (“syrah” is simply the French spelling). Kirk says the viognier component, “influences the wine in a subtle way, where the whole is greater than the sum of the parts. It elevates, expands and amplifies the aroma and palate and gives a viscous character that rounds the palate”. Fruit for the shiraz–viognier comes from Clonakilla’s original, Euroka Park and T and L vineyards; Syrah’s fruit comes only from the warmest part of T and L 1 block. The different fruit sourcing creates a vital difference between the two wines. From 1993 the shiraz-viognier ferments include whole bunches (currently 20–30 per-cent of total fruit, depending on vintage). The stems and stalks add noticeably to the aroma, flavour and texture of the wine; Syrah ferments contain no whole bunches. The non-whole-bunch component of the shiraz–viognier is de-stemmed then pumped to open fermenting vats. The pump breaks the skin of many of the berries but also leaves many intact; the aim with Syrah, on the other hand, is to keep whole berries intact, so the bunches are de-stemmed into bins, then the berries are fork lifted, not pumped, into open fermenting vats. Clonakilla syrah being de-stemmed. After de-stemmimg the berries are lifted and tipped from bins into vats where the whole-berry ferment begins spontaneously. Photo: David Reist. Once in vat, both the Shiraz-Viognier and Syrah follow a similar trajectory for a week or two: the mix of berries, or berries and bunches, as the case may be, cold soak for several days until a spontaneous fermentation begins. In the case of whole berries, fermentation begins inside the berry. 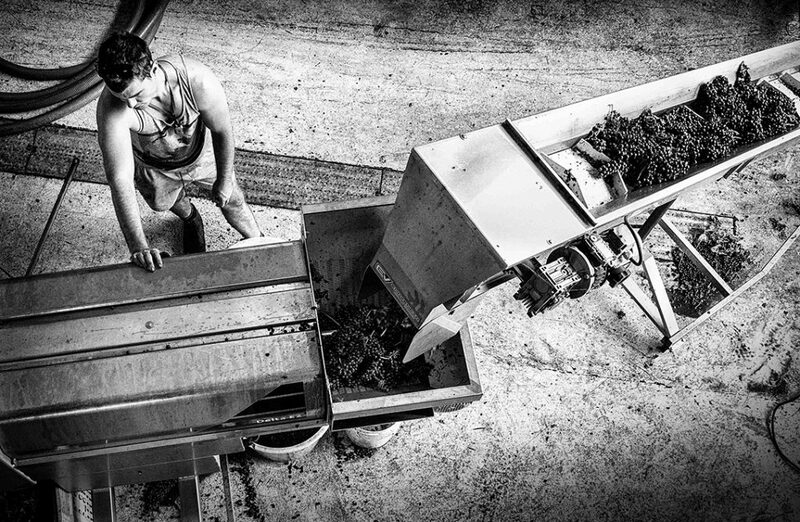 As the ferments heat up, plunging machines break up the cap of skins and grapes three times a day; as the ferment slows down, the vats are plunged daily. After fermentation, Shiraz-Viognier and Syrah, head down two different paths: both remain on skins for a time after fermentation. But the Shiraz–viognier spends a total of about 18 days on skins (three weeks in 2017); while the more robust Syrah remains on skins for 31 days (with a few one-ton batches of six weeks in 2016 and 2017). Kirk says the extended maceration of the Syrah, “mollifies the potent tannins, but they’re still powerful”. The gentler tannins of the Shiraz–Viognier don’t require such long skin contact. The many Shiraz-Viognier components are now pressed off skins into 225-litre French oak barriques, about one third of them new, for a 12-month maturation period; the Syrah components are pressed to 500-litre French oak puncheons, one-third new, for 20–22 months. The size of the barrels and duration of maturation affects the aroma, flavour and tannin structure of each wine. Oak is not obvious in either, rather the two maturation methods complement the character of each wine: the floral, lusciously fruity, silky Shiraz–Viognier and the deeper, darker, more potent Syrah, with its latent, coiled depth. Does Tim Kirk love one child more than the other? “That’s like asking whether you prefer your son or your daughter”, he laughs. “I love both. I celebrate them equally. They’re distinct personalities. I thrill in their complexity and I thinks it’s almost miraculous we can make these on this little landscape we farm”. The almost miraculous, definitely remarkable Clonakilla Syrah 2015 costs $96 at cellar door – same price as the equally remarkable Clonakilla Shiraz-Viognier 2015.